Versus You don’t really need an introduction. The punk quartet from Luxembourg has been around since 2005 and has built itself a reputation that made it across the borders. Just think back on their catchy hit song The Mad Ones and their split-Cd with punk legend White Flag. Moving On is already the band’s seventh release, including EPs and splits. The opener When It All Goes Down is a fast, catchy track that makes you hungry for more. If The Camels Die, We Die is melodic punk rock with an American touch that reminds me of Blink 182. Actually the more melodic material has been put on the album’s first half. A Way With Words is also less aggressive and has definitely airplay potential, and On The Town comes with a really cheerful mood. Be Better Than Me is somewhat controversial due to its super-catchiness, but the song with guest vocalist Hannah Smallbone still strikes a chord with me because of its great chorus. It’s only from the seventh track (One That Can See) onwards that Versus You are unwrapping their rawer side. 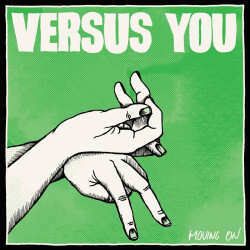 The vocals are rougher, and the coarser approach allows me to call this vintage Versus You. Only the concluding You Are My Friend is a ballad that lets you gently exit the album. As expected, Versus You once again did a masterful job. Moving On is a short and entertaining affair. If only the band would have added a couple of additional tracks.